Another night out…just me and J. This past weekend was J’s birthday, so she took a few days off work. She decided to go to her parents Friday when she got off work and I met her and L there late Saturday night. After a day of fun on the farm at The Children’s Farm at The Center in Palos Park with both sets of grandparents, we headed back to J’s parents for the night. J had been wanting to do something for her birthday, but it took us a while to decide on where to go. I pitched several fancier restaurants that I thought she’d like, but she shot them down. The winner was a sports bar in Chicago’s Wicker Park neighborhood. I first heard of The Fifty/50 on The Travel Channel a couple of years ago when they were on the hunt for the country’s best sandwich. 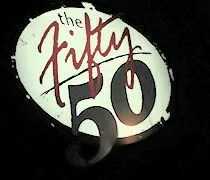 One of the sandwiches in the Midwest episode was at The Fifty/50 and I’ve been trying to get there ever since. The restaurant is on a very busy stretch of Division Street in Chicago’s Wicker Park Neighborhood. Parking is pretty tough because you’re looking at street parking. After a couple of trips around the block, we were able to find a spot about two blocks down. We walked in to a very, very busy sports bar early on a Saturday night. As we looked in the window, we weren’t sure we were even going to get a table and had started talking about alternatives. Still, we went in the door and a hostess told us she was about to clean off a table by the bar and we could have that. The space inside The Fifty/50 is tight. There’s apparently three levels of seating and the tables are packed in. We were shown to a pub style two top in the middle of the ground level floor and it was a tight squeeze for both of us to get in to our seats without bumping the people sitting behind us. The other thing you’ll instantly notice is the noise level. It’s loud. Very loud. This was supposed to be a date, but J and I like sports bars, so it worked ok for us. J said the noise level was just about as loud as she could handle. Our waitress came over and took drink orders. She talked us both in to 24 oz drinks which come in a plastic cup you can take home with you. I ordered a Green Line Pale Ale from Goose Island. The beer is only available in Chicago and only available on draft. The beer inspired the newly released 312 Urban Pale Ale which is available nationwide. 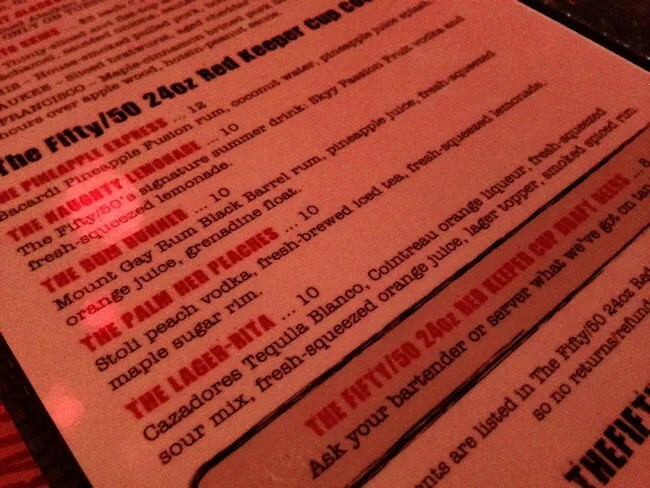 J’s choice was off the mixed drink side of the drink menu. The Palm Her Peaches was her drink of choice. The drink is made with Stoli Peach Vodka, fresh-brewed ice d tea, fresh squeezed lemonade and maple sugar rum. We skipped the appetizer because we were sort of saving room for dessert. We went straight to the dinner menu once the waitress came back with the drinks. There was no way I was walking in to this place and not ordering the sandwich that brought me in. There were a lot of burgers that sounded delicious, but I passed on the burger completely and ordered The Four Courser. Please, try to control your drooling as a list off the ingredients on this monster. 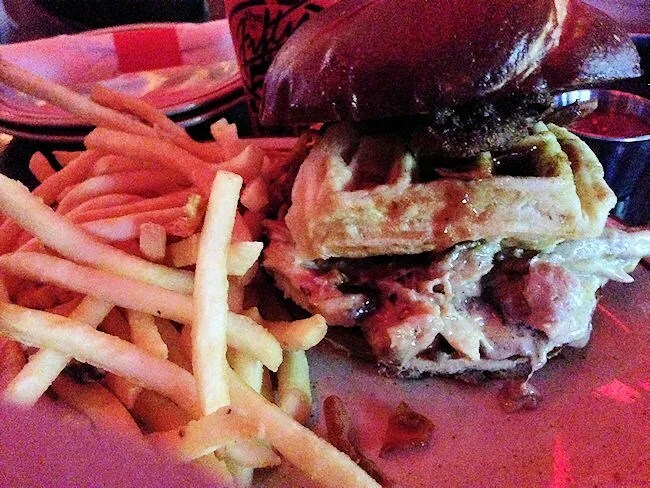 The sandwich is apple wood smoked pork shoulder, a warm gouda béchamel, deep fried jalapenos, sweet potato chips, smoky BBQ sauce and a mac ‘n cheese waffle on a pretzel bun. Back up there a second, yes, that says Mac ‘n Cheese waffle. They actually take mac ‘n cheese and turn it into a waffle then put a section of that waffle on the sandwich. It was amazing….as was the rest of the sandwich. There were so many flavors going on, but they all popped. Nothing got lost in the mess of a sandwich. The disappointing part was actually the fries that came with the sandwich. They appeared to be a simple out-of-the-bag frozen potato. J went a little bit healthier than I did. She started with the Wicker Park Salad. 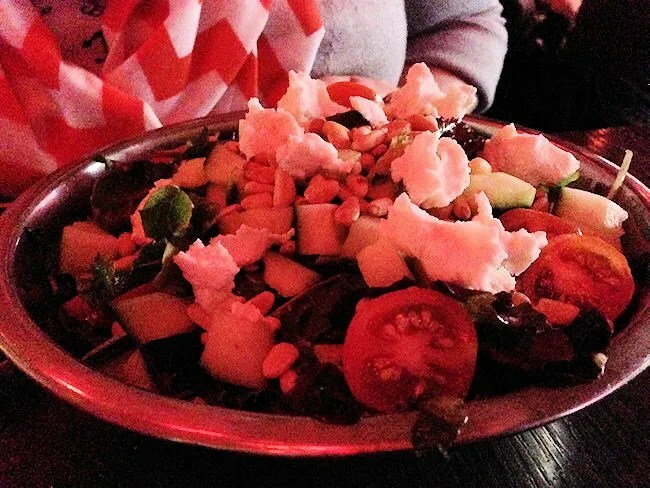 The bed of mixed greens is topped with toasted pine nuts, goat cheese, cucumbers, cherry tomatoes and a roasted shallot vinaigrette. It was a good start to the meal as is anything with goat cheese on it. 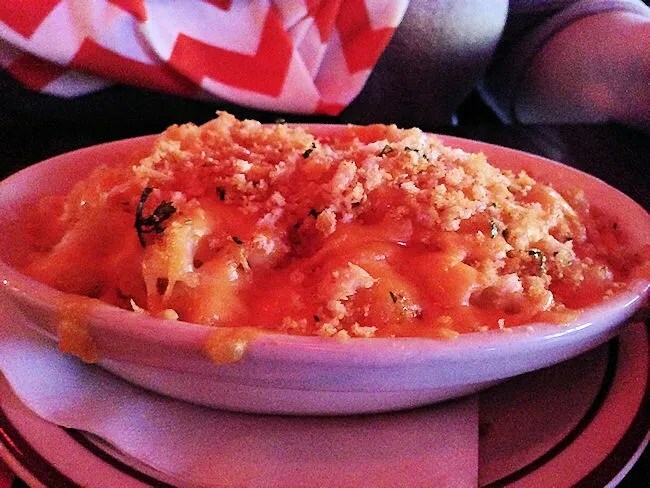 For her entrée, she chose a side of the Mac ‘n Cheese (the non-waffelized version). The creamy noodles come topped with an Asiago bread crumb. She said the mac ‘n cheese was incredible. She stopped short of saying it was the best she’s ever had, but it does rank pretty high on the list. Our bill was right around $60 and we opted to skip dessert here and move on to Mindy’s Hot Chocolate in Bucktown to finish off the night. 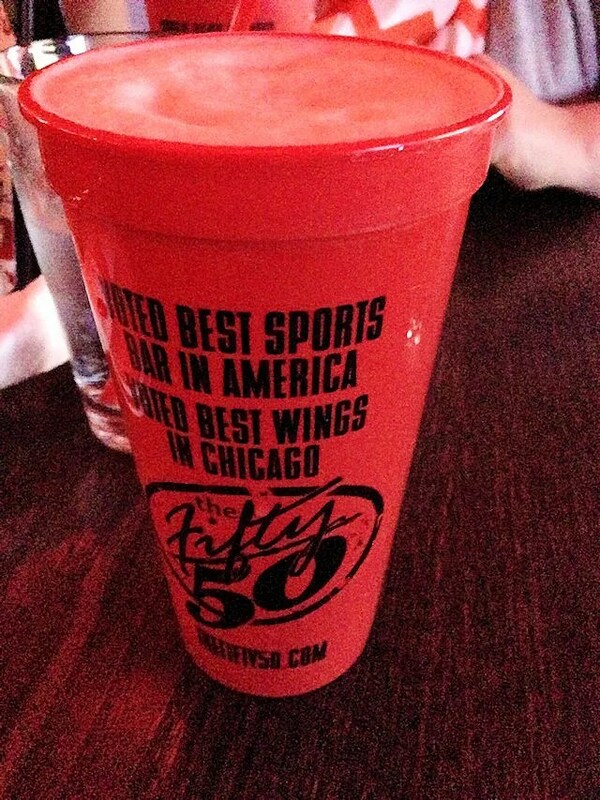 The Fifty/50 was everything I was hoping it would be. I know they’re a pretty popular spot, but I was surprised at how hopping the bar was on a Sunday evening. We got a late start on J’s birthday dinner, but it turned out to be a really great night. Once again, we choose the sports bar over some fancy white table cloth place and we both have a lot more fun and get a lot more out of it. I love that about us.